These statues are the remnants of a cattle invasion that occurred in Calgary 15 years ago this month. “Midnight Cowgirl” and “Quantum Cow” reside in the Udderly Art Legacy Pasture. Raise funds for many charities. The molded fiberglass cows were originally white, clocking in at 54 inches tall from head to hoof; 84 inches long from nose to tail; and weighing 90 pounds. (Though that number shot up to 900 once the concrete bases were added). Individuals and companies who initially purchased the cows for $5,000 each chose which artist would work on their bovines and, starting May 15, 1999 the cows were on display everywhere in the city from the airport to the zoo. 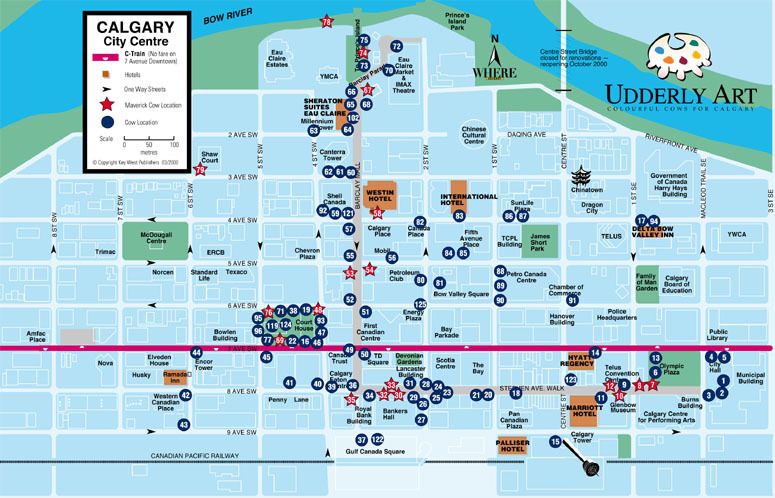 A Map of the Udderly Art cow locations in downtown Calgary during the event. In October of that year, they were rounded up and sold at auction, with the more than $1.2 million netted going to benefit 76 different charities. Though many cows ended up in private residences, including some in Vancouver, Toronto, Thunder Bay and the United States, others found their way to institutions. “MooovOver” is at the Alberta Children’s Hospital, “Pump Jackie” is at the Rockyview Hospital and “New Sun” is at the Glenbow. The most prominent cow collection still accessible to the public is the Udderly Art Legacy Pasture, which you can find near the Centennial Parkade +15 walkway along 9th Avenue S.W. from 5th to 6th Street. The permanent home of 17 of the cows since 2001, it also has background information on both the individual statues and the project itself lining the walls. If you can’t be bothered to go cow hunting yourself, you can see portraits of nearly all 126 members of the Udderly Art herd in their original spots right here and even a cached version of the original project’s website here (warning: contains early internet animations and layout). “New Sun” in the Glenbow’s storage facility . “Chew-Choo” the cow, one of 17 in the Legacy Pasture. “Jingle Belle” a Christmas-themed cow, stands inside the Udderly Art Legacy Pasture.